Today we are sharing a gorgeous winter sky card by Samantha! 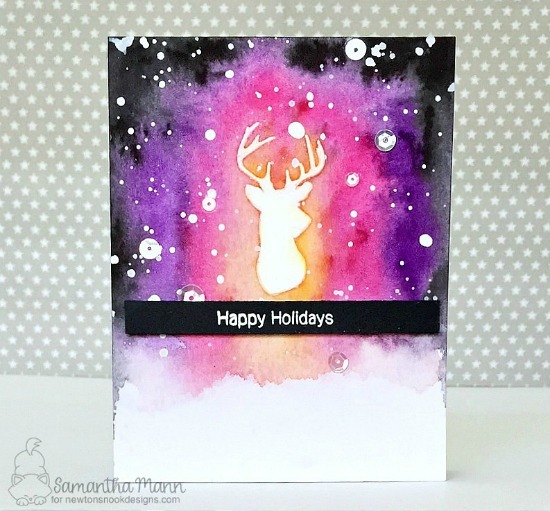 She created this amazing card using our Splendid Stags Die Set. She cut the deer head out using the die but instead of using the die cut shape she took the negative shape and used it as a stencil! She applied white embossing paste over it to get a dimensional deer head on her card. Then she added layers of watercolor over the top to create that amazing sky! She splattered on some white paint and sequins for the stars. To finish it off she stamped "Happy Holidays" from the Holiday Smooches Stamp Set and embossed it in white over strip of black cardstock! This card is so striking and pretty! Such a unique idea for a Holiday card! Thank you Samantha for the fun card today! To say hello to Samantha and see more of her beautiful creations, you can visit Samantha's Blog, Sam's Scrap Candy! those colors are so nice! That really is an impressive card !